The entire dandelion plant is a primo liver healer and strengthener. We can live without our fingers, we can lose an arm and still keep going, but we can’t live without our liver! Dandelion nourishes and strengthens our immune system. It is a digestive bitter, as it heals and nourishes the entire digestive tract. It helps us to get full nutrition from the foods we eat, and tones and nourishes the spleen, skin, nerves, kidneys, glands, urinary, circulatory, lymph, and gallbladder. It contains bioflavonoids and polyphenols that protect cells from damage and can cause apoptosis (that’s cell self destruction) in certain cancers. That’s a lot of healing and nutrition from a plant that most people try to eradicate from their yard and gardens. My favorite way to use dandelions in the winter is to dig up the roots, clean them well, chop them up by hand or food processor, and roast the roots. I put the chopped roots on a cookie sheet, put them in a 250 degree oven, and roast them for about 3 hours until they are completely dry and dark brown. At the halfway point, you’ll want to stir them up a bit. 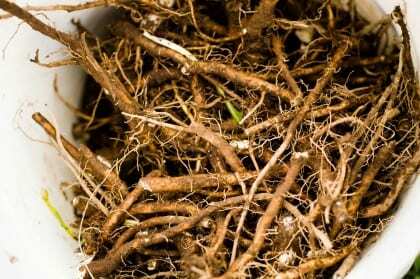 Put your roasted dandelion roots in a jar for winter enjoyment! I will put a couple cups of water in a saucepan, add roughly 3-4 tablespoons of the roasted roots, turn up the heat, and bring the water to a boil. Immediately turn the heat down to medium heat, and let simmer for 15 minutes, and strain. Try drinking this with raw milk and a bit of herbal honey.